The 7-day "Wake Up!" Devotional was created by FrontGate Media and features leaders in ministry, music and publishing. The devotional is now available for free download on the album website and YouVersion’s The Bible App. We hope you will not just listen to and enjoy the words and music from the “Wake Up!” album, but that you will engage with and grow from Pope Francis’ message of unity, charity, and hope that transcends all the issues that separate God’s children. Leaders in ministry, music and publishing from the faith-based community have come together to contribute to a 7-day devotional companion to Pope Francis’ album “Wake Up!”. The devotional is available free of charge on the Pope Francis’ “Wake Up!” album website at http://popefranciswakeup.believedigital.com. During the month of February, the Wake Up! Devotional is also available in YouVersion’s The Bible app which is available for free download all phone, tablet and computer platforms at http://bible.us/r/Z4. The YouVersion Bible app has been installed on over 210 Million devices in 895 languages. The devotional was curated by Scott A. Shuford at FrontGate Media. FrontGate Media received the contract to provide public relations and marketing for The Pope’s faith-based album outreach. While working on the project, Scott had the idea to create a devotional that would deepen users’ engagement with the album’s messages and musical themes of unity and common good, and began reaching out to leaders in both the Evangelical and the Catholic communities. Rick Warren, who has helped people live with hope and purpose for more than 40 years. He’s the founding pastor of Saddleback Church in Southern California and author of several books, including "The Purpose Driven Church" and "The Purpose Driven Life," read by more than 100 million people in 137 languages. Marcus Hathcock is the Executive Editor of NewReleaseToday.com, the largest Christian music and media site, offering the most complete and up-to-date info on faith-based arts and entertainment, and home to the NRT Radio Network with five unique stations featuring dance/electronic, worship, rap/urban and more. Jaci Velasquez has produced sixteen #1 radio hits across 17 albums, winning 7 Dove Awards, 3 RIAA Gold Records and 3 RIAA Platinum records. Jaci has also been the co-hostess on Salem Broadcasting Network’s nationally syndicated “Family Friendly Morning Show with Doug and Jaci Velasquez” for nearly five years. Matthew Willkom is the Morning Show Host and Program Manager of Spirit Catholic Radio Network. Matthew holds a Master’s degree in Pastoral Theology from Ave Maria University. Spirit Catholic Radio is heard in the U.S. throughout the Upper-Midwest and worldwide online. Matt Maher has become a staple in the artistic and songwriting community. An eight-time GRAMMY® nominee, he has garnered multiple radio successes writing and recording songs like “Lord, I Need You,” “Your Grace Is Enough,” “Because He Lives (Amen),” and more. In 2013, Maher performed on stage with Pope Francis in front of more than three million people at World Youth Day in Rio de Janeiro, and will perform at World Youth Day 2016 in Krakow, Poland. Olujimi (Olu) Brown is the founding lead pastor of Impact Church, the fourth fastest growing congregation in the United Methodist Church-USA. Impact, located in the East Point community of Metropolitan Atlanta, GA, is committed to sharing the love of Christ with the world. Olu is a graduate of Gammon Seminary/ITC. Keith Fournier is the Editor in Chief of Catholic Online, one of the world’s largest integrated media platforms dedicated to presenting the Catholic Christian worldview in this new missionary age. Keith is a Deacon of the Diocese of Richmond, Virginia, U.S.A., Constitutional lawyer, speaker, teacher and published author. He holds a Bachelors and Masters Degree in Theology, a Juris Doctor Degree in Law and is completing his PhD in Moral Theology. Pope Francis is a forward thinking spiritual leader who has given the Catholic Church a new energy. The Pontiff has millions of followers all whom turn to Francis for prayers, requests, and intercession to which he responds personally and graciously. The album is connecting spirituality and the modern ideals of the collective by bridging faith and the common good through contemporary music. “Wake Up!” includes tracks in Italian, Spanish, English, and Portuguese. 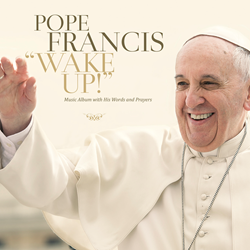 The “Wake Up!” devotional and album are available now at http://popefranciswakeup.believedigital.com.